Why this project could change the way of addressing housing problems? 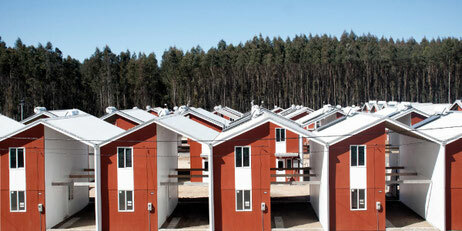 "Houses divided by two", a project aimed to create dignified housing in Chile. A radical and controversial idea, say some, others described as a great concept. The type of original concept which changes by much the way of seeing the world, at first observed with apprehension, but which soon is received with open arms. And that is precisely what happened when the prestigious architect Alejandro Aravena decided to rebuild the homes for the Constitución town, one of the cities most affected by the earthquake and tsunami that struck Chile in 2010. As part of the relief plan, this architect was hired to devise a master strategy to rebuild the city and specifically to develop new housing for the homeless who were left displaced by the disaster. But the structures created by the firm presented a peculiar approach to construction. They offered simple, two-story houses. However, they had a wall that separated the residence in two: on one side, one half of the house was completely finished; on the other half laid an empty space. However the structure was finished on both sides and the basic installations such as sewerage and electrical main installations. In Chile, a middle-class family can afford a house of 80 square meters, but a low-class family is lucky if it can have the funds for 40 square meters. Aravena thought: Why not give them half of a "good" house instead of a complete "bad one"? In this way, the inhabitants of these residences can live in dignity in one half, and gradually build the other half, in the future. In this project, the ground floor of the finished half has a suspended concrete slab floor while the one in the second was made of plywood. The kitchen has just a sink and no other appliance, but the house is economical, practical and well insulated. Everything that families could not easily build in is already installed, such as the complete structure, plumbing and electricity. The only thing residents have to add is their time, effort and extra finishing materials. The Constitución project was not the first project in which this firm of architects tested their “half homes”. In 2002, the firm took a project that required the construction of 100 units of low-budget housing in the city of Iquique, Chile. Its budget was 7,500 USD per unit. The community did not want popular high-rises, and that's how the houses divided by two were born. But this concept did not come out of nowhere: in the 1970s, John F.C. Turner, an MIT professor who taught the subject "Designing Urban Housing in Developing Countries," theorized that people could build their own homes. Turner's premise was that housing should be considered as an on-going project. In turn, this idea inspired the architect George Gattoni, who was trying to solve the problem of urban migration. Gattoni found in this form of "incremental construction" the answer he needed. 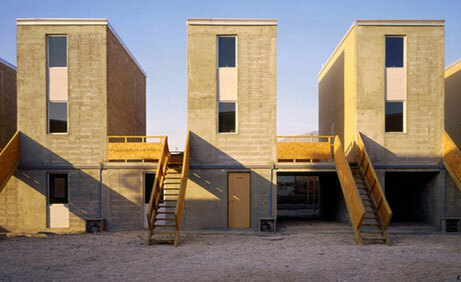 Alejandro Aravena, an imaginative architect with social conscience. In early 2016, it was announced that Alejandro Aravena was the new winner of the Pritzker Prize, the most prestigious of the field of architecture. The 48-year-old artist was the first Chilean to receive this award and the fourth Latin American after Luis Barragán (1980), Oscar Niemeyer (1988) and Paulo Mendes da Rocha (2006). In early 2016, it was announced that Alejandro Aravena was the new winner of the Pritzker Prize. Since 2001, Aravena has been executive director of Elemental, an architectural studio based in Santiago de Chile that focuses on projects of public interest and social impact. Elemental received in 2008 the Silver Lion of the Biennial of Architecture of Venice for having put the architecture to the service of the needs of the society. Among other projects, the firm designed more than 2,500 low-cost residential units. Philosopher Thomas Pritzker explained that "his work provides economic opportunities to the less privileged, mitigates the effects of natural disasters, reduces energy consumption and provides public space for all." Alejandro Aravena has been a pioneer in a collaborative study that produces impressive works and, addresses the challenges of the 21st century.